After final study and interview process with UIJC rabbi, not all members could finish the studies and fulfill our requirements. Therefore, we let the ready students to meet our rabbis. Shelley Estaire Kunin, a Hebrew School of JJC Japan. Rabbis arrived Yogyakarta on 12 July 2016 from Bali, and did interviewed Magelang Group in Yogyakarta on 13-14 July. Mikveh was done at the spring of Water Department in Magelang. After conducting shabbat with BBI Jakarta on 15-16 July 2016, Beth Dinh did interview for convert candidates on 17 July 2016 at the Peak (Frasseur) Apartment, and Mikveh (immersion) done at Ancol beach Jakarta. Beth Dinh took flight to Timika Papua, via Makassar on 18 July. Group of Jayapura joint Timika group for the interview. Our kehila BBI Mahanaim SP3 Timika Papua has built 2 beautiful Mikveh Pools in their big shul where they collected the rainfall water. 3. UPJ Conference in Adelaide, West Australia 19-23 Nov 2014. In short time, the rabbis from Moetzah of UPJ will supervise physically our 268 members in 6 kehilots. They will teach and guide BBI/UIJC for the necessary works including the conversion programs of newly joint members. The United Indonesian Jewish Community (UIJC) was established to respond to the outcry of the descendants of Jews in Indonesia who longed to know the G-d of their forefathers. The community leadership's policy was to accept all and every descendant, whether it be of matrilineal or patrilineal descent, and despite of their current religious practices. In its development, many of these descendants showed tremendous dedication and thirst to know the truth and to seriously return to the faith of their ancestors. These people were gathered in smaller groups of communities called Kehilla, and exist in Lampung, Jakarta, North Sulawesi (Manado) and Maluku - and recently, a community of Magelang - Central Java and SP3, Timika Papua emerged with the same longing. (For a list of these communities click here.) The yearning was so strong that many Jewish people from all over the world was drawn to it. In the effort of studying about the Torah and Judaism in the midst of severe lack of resources, a helping hand individual rabbis provided answers when no one else was available and even facilitated the community in connecting with another Rabbi in the region, which will happen much later. Cantor Evan Cohen of Kehilat Har-El in Jerusalem was the first who was moved by this strange wave of Indonesians celebrating Shabbat and praying to the G-d of Israel. With the facilitation of one of UJIC's former elder member Mrs. Marlina van der Stoop, he came to Indonesia for a visit in November 2012, to the community in Jakarta as well as in Manado. He stayed long enough to lead a few Shabbat services and teach about the holiday of Hannukah. During his stay here, he also visited the historical old city of Batavia, which was founded by a Dutch Jew, Jan Pieterszoon Coen, the Governor General of the Dutch East Indie Company in Indonesia. 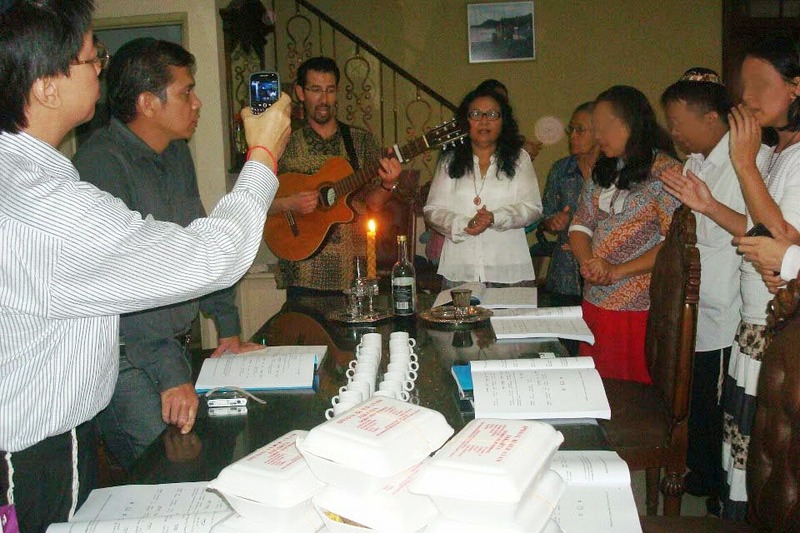 The visit of Cantor Evan Cohen, who lead the Shabbat service with beautiful melodies, inspired one of the community members in Jakarta to learn about Jewish liturgical chanting on her own, solely depending on resources on the internet. This will later surprise the mentoring and converting Rabbis as they enjoyed the Shabbat Sacharit service in Jakarta. The non orthodox - liberal Jews called Brit Beracha community was founded in November 2012. It was also thanks to Mrs. Marlina van der Stoop and Cantor Evan Cohen's facilitation that the Jewish community in Indonesia are currently in process of affiliating itself with the World Union for Progressive Judaism. For this purpose, the leadership of UIJC has participated in the UPJ mini convention in Hong Kong in May 2013 as well as the WUPJ convention in Jerusalem in the same month. In April 2013, with the facilitation of Christians for Israel Indonesia, UIJC, represented by Jakarta's leader and member, was introduced to Rabbi Ari Abramowitz and Shaul Ravid who were then with Keren Hayesod. This was further progress in trying to connect with the rest of the Jewish community of the world and obtain some form of acknowledgement of its existence. Rabbi Jonathan Ginsburg and Rabbi Steven Jules Peskind were two of the first ones to respond to the community's desire to convert. Many other rabbis of different affiliations have rejected the same request for various reasons. Rabbi Ginsburg mentored the community and supplied various books and resources on Judaism, feeding the community's hunger. After many months of mentorship and studies, in January 2014, he and Rabbi Peskind flew across oceans to meet with the community and guide them in their last steps of official conversion. For their love for these souls, they dared to venture into the unknown, setting foot in what they only knew as a country with the largest Muslim population in the world. During the course of the conversion study, a member of the community made contact with Orthodox Rabbi Zev Schwarcz of the International Kosher Council who was fascinated to learn about a Jewish community in Indonesia. Although contact was made since before the conversion, it was only after the conversion that he had the opportunity to visit the community during one of his regular visits to Indonesia to assist a few Indonesian businesses in kosher certification. Since then, Rabbi Schwarcz has been in close communication with the community, and shares teachings to the community via Skype conference. The Jewish community of UIJC has taken up more and more responsibility to join wider Jewish Communities, besides its main duty as ohr l'goyim, spreading the truth of Torah to the Jewish descendants and leading them back to the G-d of their ancestors, and working towards the unity of the Jewish people. In November 2014, the leaders of UIJC will once again join a conference to be held by WUPJ, strengthening the bond and friendship, paving the way for future collaboration, contributing to the restoration of the world. The leadership of UIJC continues to cater to the community's needs - guidance in celebrating Yom Tov, facilitation in obtaining Judaica as well as assistance in various family issues such as brit milah. To lead 6 kehilot, the leader of UIJC trained 4 laymen or spiritual leaders with Para Rabbi Certification, so that they know how to lead services and do life-cycle ceremonies for their members. Benjamin Meijer was at last ordained as a modern rabbi from Rabbi (Modern Chasidic) Joseph H. Gelberman Rabbinical Seminary International New York, at Actors Temple, 47 Street, West Side Manhattan New York on 02 July 2015. The story of UIJC and its members for sure will not end here. Having been carried in the tummy of the Conservative Movement, delivered by the midwives of the Progressive Movement and being fed with milk and honey by some Orthodox Movement, the Jewish community will continue on its spiritual journey towards the perfection of their souls until the day they join their Jewish ancestors in the Olam Haba.